Not since the German government arranged for Vladimir Lenin to return to Russia, crossing German territory in a sealed train on April 16, 1917, has a foreign state at war with Russia done something as revolutionary as the US Senate did on June 15, 2017. That is when, by a vote of 98 to 2, the senators began the process of attacking the Russian oligarchs. They are the men who have dominated the Russian economy for more than twenty years, concentrating more national wealth in their hands than can be found in any other major state in the world today. Unremarked by the senators themselves; unreported by the American press; and unnoticed, almost, in Russia, the new measure — if adopted by the full Congress and signed into law by President Donald Trump — will target the oligarchs’ lines of credit to international banks; the brokers, repositories and clearinghouses of their shares and bonds; their trade with the US and Europe; their US companies, bank accounts, boats on the high seas and homes abroad. If targeting the oligarchs is followed by formal sanctions, the aim will be to destroy their power at home and abroad. The Communist Party of the Russian Federation hasn’t contemplated this much. 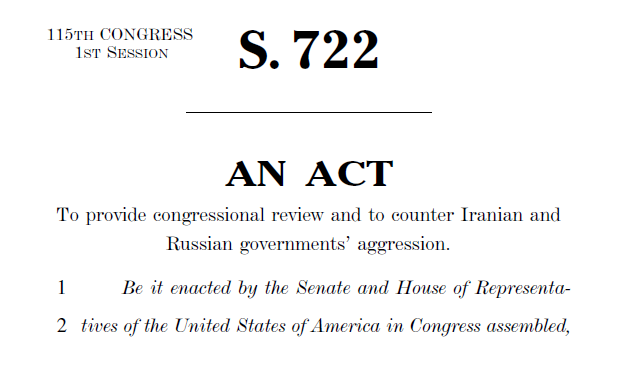 Senate Bill S. 722 started in March with Iran as its target. For short, it was called the ‘‘Countering Iran’s Destabilizing Activities Act of 2017’’. Title I of the bill and 29 pages of its provisions deal with Iran. Then Title II was added. It runs for 94 pages and targets Russia. Read the text in full here. In practice, as the text of the bill continues, this is aimed at all Russian exports of energy, including pipelines under the Black Sea and in the Far East, and tanker shipping, particularly the oil and gas tanker company, Sovcomflot. Privatization of part of the state shareholding in Sovcomflot, which has been postponed for years, has been promised by federal property agency officials for later this month. However, the Senate bill threatens to sanction any company, US or other, which makes an investment of up to $10 million “if the investment directly and significantly contributes to the ability of the Russian Federation to privatize state-owned assets in a manner that unjustly benefits— (1) officials of the Government of the Russian Federation; or (2) close associates or family members of those officials.” That puts the kybosh on Gennady Timchenko, front-runner for the Sovcomflot share sale, and father-in-law of Gleb Frank, son of the chief executive of Sovcomflot, Sergei Frank. For background, read this. But the Senate bill goes much further than attacking foreign investment in share sales for Russian state companies. It attacks the shareholding control of most of the country’s resource assets – that’s to say, the oligarchs. Section 241 of the new bill is entitled “Report on Oligarchs and Parastatal Entities of the Russian Federation.” Read carefully. (A) An identification of the most significant senior foreign political figures and oligarchs in the Russian Federation, as determined by their closeness to the Russian regime and their net worth. (B) An assessment of the relationship between individuals identified under subparagraph (A) and President Vladimir Putin or other members of the Russian ruling elite. (C) An identification of any indices of corruption with respect to those individuals. (D) The estimated net worth and known sources of income of those individuals and their family members (including spouses, children, parents, and siblings), including assets, investments, other business interests, and relevant beneficial ownership information. (E) An identification of the non-Russian business affiliations of those individuals. (A) The emergence of Russian parastatal entities and their role in the economy of the Russian Federation. (B) The leadership structures and beneficial ownership of those entities. (3) The exposure of key economic sectors of the United States to Russian politically exposed persons and parastatal entities, including, at a minimum, the banking, securities, insurance, and real estate sectors. (4) The likely effects of imposing debt and equity restrictions on Russian parastatal entities, as well as the anticipated effects of adding Russian parastatal entities to the list of specially designated nationals and blocked persons maintained by the Office of Foreign Assets Control of the Department of the Treasury. The senators voted in favour without deciding on a definition of Russian oligarch, corruption, “closeness to the regime”, “relationship to President Vladimir Putin or other members of the Russian ruling elite”, or “parastatal”. 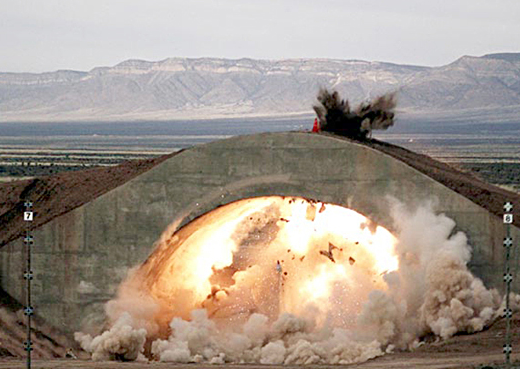 Still, the meaning and intention are as clear as the US Air Force’s MOP (Massive Ordnance Penetrator) – the bunker buster. The targeting of Section 241 includes almost every major Russian corporation, its control shareholders, associated banks, and their offshore businesses. The stated aim is nothing less than to destroy those of them who side with the Kremlin; recruit the remainder for US-backed regime change; and pit each against the other, all against the Kremlin. Selective oligarch targeting is already in effect; click to open for the current list. Timchenko has been sanctioned by the US and the European Union since 2014. Other oligarchs also proscribed include Sergei Chemezov, head of the state asset holding, Russian Technologies (Rostec); Yury Kovalchuk of Bank Rossiya; Boris and Arkady Rotenberg, who control SMP Bank plus pipeline and infrastructure businesses, and Roman Rotenberg, Boris’s son; Igor Sechin, chief executive of Rosneft; Nikolai Shamalov, also of Bank Rossiya and father of Kirill Shamalov, Putin’s son-in-law; and Vladimir Yakunin, former head of state-owned Russian Railways. The Christmas dinner which Putin has hosted each year since the war started in Ukraine identifies by name four dozen potential targets in the latest act of US war. Read the guest list for 2014; for 2015; and for 2016. Missing from the official sanctions lists so far, but with substantial US assets, are Anatoly Chubais, head of the state high-technology holding Rusnano; Mikhail Abyzov, financial backer of Prime Minister Dmitry Medvedev and minister of open government in his cabinet; and Mikhail Fridman of the Alfa Bank, LetterOne and Vimpelcom groups. Vimpelcom has been prosecuted for corruption by the US Department of Justice and fined $397.6 million, the ninth largest such penalty in US history. More recently, Alfa was targeted for allegedly operating clandestine connections with the Trump presidential campaign. Two of the oligarchs with valuable residential assets in New York, and solid relationships with Putin, are Oleg Deripaska (lead image), who controls the state aluminium monopoly Rusal; and Roman Abramovich, the control shareholder of the Evraz steel group, which runs steel and pipemills in the US and Canada. 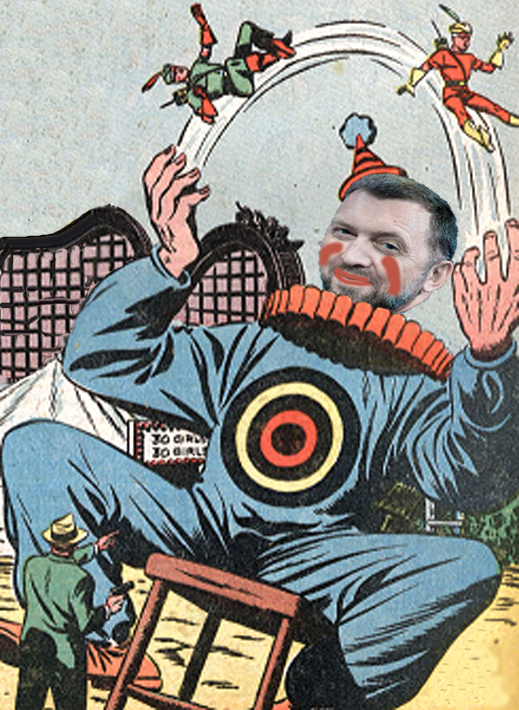 Deripaska owns at least two homes in Manhattan, but is prevented from living there by a longstanding US visa ban which his Washington lobbyist has been unable to remove. For Deripaska’s New York assets, read this ruling of April 25, 2017, by New York Supreme Court Judge Anil Singh. To view Abramovich’s homes on East 75th Street, Manhattan, click to open. 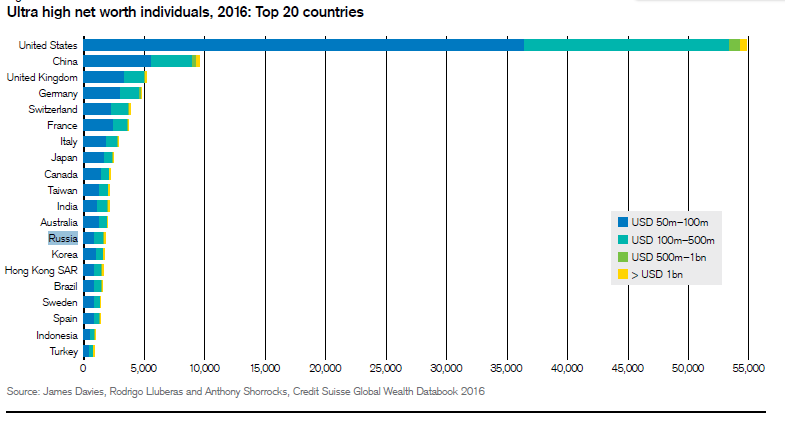 Another way to anticipate who will be informally targeted by the US shortly — formally later — is to look at the concentration of Russian wealth, and identify Russia’s ultra high net worth individuals, the multi-millionaires. By world standards, the Russian count is in the top-20, but trails far behind the US, China, and several European and Pacific Rim countries. A new study on inequality in Russia, published in February by the Analytical Centre of the Russian Government, confirms that the impacts on income, assets, and net wealth have been bad for the middle class of Russian income earners, and disastrous for the Russian poor. The divide between rich and poor has been getting worse, according to this English summary. Source: http://ac.gov.ru/files/publication/a/11944.pdf -- page 5. So it is now the calculation of the US Senate, to be followed by the Congress and likely by the President, that Putin’s greatest vulnerability in the present situation is not simply cronies like Timchenko, Kovalchuk or the Rotenbergs, but the inequality of the entire Russian oligarchical system. In the past, there was a brief attempt by the US intelligence services to target some of the oligarchs. In 2010, when Admiral Dennis Blair was Director of National Intelligence (DNI), his annual threat assessment for the US Senate Intelligence Committee reported “[there is] a growing nexus in Russian and Eurasian states among government, organized crime, intelligence services, and big business figures. An increasing risk from Russian organized crime is that criminals and criminally linked oligarchs will enhance the ability of state or state-allied actors to undermine competition in gas, oil, aluminum, and precious metals markets.” Implied but unnamed were Alexei Miller (Gazprom), Deripaska (aluminium), and Suleiman Kerimov (gold). A year later, Blair’s successor as DNI, Lieutenant-General James Clapper, repeated the line: “The nexus in Russian and Eurasian states among some government officials, organized crime, intelligence services, and big business figures enhances the ability of state or state-allied actors to undermine competition in gas, oil, aluminum, and precious metals markets.” Read more. The DNI annual reports were no more than that – no action was recommended, and none followed. S.722 goes much further, codifying the existing Russian sanctions in statute which the White House cannot relieve by presidential decree; imposing new sanctions the same way; and setting up a scheme of reporting of new targets. By itself, the report process will immediately trigger informal sanctions, with or without the formal orders to follow. In this new Senate bill, the targeting is no longer crimes committed, or even the restraint of competition, but Russian wealth itself, and the oligarchs who have most of it. That is revolutionary. So is the exception in Section 241(a)(1)(A) for “their closeness to the Russian regime”. That’s a call for the oligarchs to join Mikhail Khodorkovsky in open rebellion.